Children’s bedrooms pose an interesting challenge: while you can have fun planning whimsical and complex themes like outer space, princesses, or under the sea, like most things, your kids will eventually outgrow those styles and want something different. Instead of creating a room you will have to redesign in a few years (which can be expensive! ), try these tips to create a bedroom that can grow along with your child and their ever-changing interests. Let your kids have a say…within reason: After all, this is their bedroom. 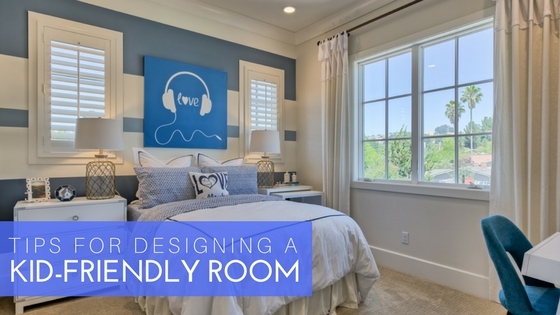 Allowing them to choose some of the furniture, colors and general theme for their room will allow them to create a bedroom that reflects their personality and give them a sense of ownership. Be sure to explain that you still hold parental veto rights so you’re not painting a room in rainbow colors or buying obviously themed furniture (see more below!). If your child is older, ask for their input on what they want or need in their bedroom and create a plan together. Choose “mature” tones of color: While kids may have a favorite color, they won’t understand how to choose a color that will coexist with the rest of the home. Instead of leaving the entire decision to your children, allow them to choose a potential room color and select a few different appropriate shades for them to choose from, so instead of a bright lemon yellow, select some softer yellow tones for your child to pick. This will keep you from having to repaint from year to year. Opt for classic furniture pieces: Fun themed-furniture is always fun but while your 6-year old loved his racecar bed, he may not love it as much anymore when he’s 10, leaving you stuck with a racecar bed. This is where parental prerogative overrides childhood desires: choose bedroom furniture you like and will grow with your child, like a convertible crib that can be transformed into full-sized bed perfect for older kids and teens. Personalize with toys and accessories: Here’s where you can indulge your child’s current interests! Inject some personality and fun into your child’s room through their toys and fun, trendy accessories that are easy (and inexpensive) to replace. Use bright patterned bedding, pillows, or curtains to create a playful feeling in the room and decorate by showcasing books and toys. Balance fun and energic with peace and quiet: A child’s bedroom should be fun and expressive but remember they also need a place to unwind and relax just like adults. It’s important to find a balance between stimulating activities (like toys) and colors and soothing elements that will help your child transition from activity to resting, especially at bedtime. The options for creating a unique bedroom for your children are endless, but with careful planning, you can design a room that will grow with them over time.